Even though it feels like we just put away our Christmas decorations, Lent is right around the corner. After a joyous preparation for the coming of Christ as a little baby in the manger, we are getting ready to enter into a season of penance. We're preparing our hearts to see our Savior betrayed, beaten, condemned, scourged, nailed, and risen. With so many incredible Lenten journals out there to choose from, it can be a hard decision to pick which one to read and write! Different devotionals offer various ways to deepen you walk with Christ throughout the season of Lent. What a blessing to have choices between incredible resources! I've prepared with the Blessed is She journals before, and have loved every minute of them. Last year, I prepared for Advent with Rooted in Hope. The reason I've returned to Take Up and Read is because I love the planning aspect of the journal. I often get sucked into to-do lists and accomplishments. But Take Up and Read journals encourage me to stop my hurried pace and abide with Christ. This year, I'm excited to start diving into Above All, a Lent journal from Take Up and Read. 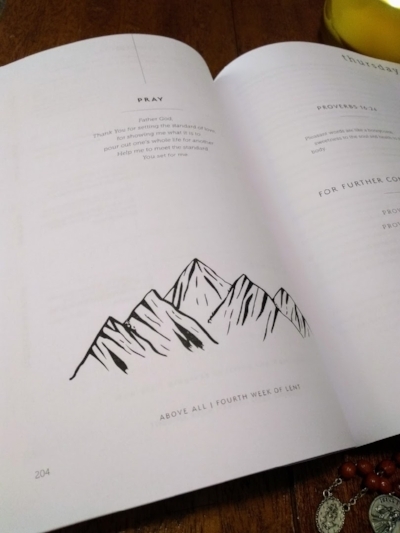 This Lenten journal includes daily Scripture passages, devotions, beautiful space to journal, and (my absolute favorite!) space to organize your day with Christ at the center. It encourages time spent with Lectio Divina throughout the day, and provides space to offer forgiveness to those who hurt us. Click here to learn more about Above All! So just what's inside Above All? Here's a sneak peek into the journal! Each day of reflection begins with prayer. I loved the prayer written to start of Ash Wednesday: "Jesus, I want to know Your voice. Please instill in me a desire for Your Word. Make me want to spend time with you." What a beautiful prayer - I love praying for the desire to pray and spend time with Our Lord! Part of the daily reflection includes Scripture readings. They're set in context with historical notes to deepen your understanding of God's word. After the passage, more Scripture is recommended if you wanted to dig deeper into the theme offered for the day. I'm not the best at memorizing Scripture, and admittingly rely on Google (and Alexa) too much. So the fact that Above All encourages readers to memorize Colossians 3:12-17 was a huge draw for me. Memorization is aided with seven beautiful calligraphy pages! 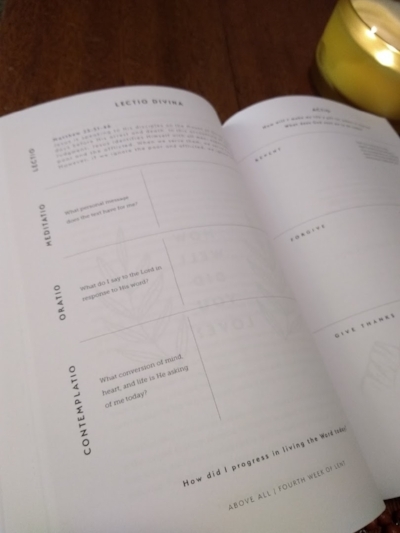 I love reflecting on Scripture with the amazing women who contributed to this journal. You'll find reflections from Carly Buckholz, Micaela Darr, Emily DeArdo, Elizabeth Foss, Ana Hahn, Mary Lenaburg, Allison McGinley, Laurel Muff, Heather Renshaw, Kathryn Whitaker, and Kate Wicker. Without a doubt, each reflection has always met me exactly where I'm at. These women come alongside you on your walk through the liturgical season of Lent and encourage you on your path to Christ. They always write exactly what I needed to hear - God definitely speaks through the words of these women. Following the lead of Father Benedict, Above All focuses on being drawn into Scripture. Each day includes digging into the meaning of Scripture and how it applies to our lives. First, the passage is read, then mediation and contemplation follows. New to Lectio Divina? Above All beautifully walks you through, step by step. Each day ends with two questions - How will I make my life a gift for others in charity? What does God want me to do today? Then, you go through three steps of repentance, seeking forgiveness, and giving thanks. Each day examines a different area of the interior life and leads an in depth, Lent-long examination of conscience. I loved the beautiful watercolor picture of the San Fernando Cathedral in San Antonio, Texas. Recognize the work? You may know the artist, Christie Peters, from Every Sacred Sunday! Find out more about Every Sacred Sunday in my interview with Kassie Manning, "A Letter to the Woman Who is Bored at Mass"
Profits from the sale of Above All are donated to Adore Ministries in Houston, Texas to provide ongoing hurricane relief. I'm eagerly counting down the days for Lent to start so that I can start reading Above All. When Easter Sunday comes, I want to be able to shout Alleluia! and mean it. Old Fashioned Girl is a participant in the Amazon Services LLC Associates Program, an affiliate advertising program designed to provide a means for me to earn fees by linking to Amazon.com and affiliated sites. There is nothing that I like more than a cup of coffee and a good book to curl up with. 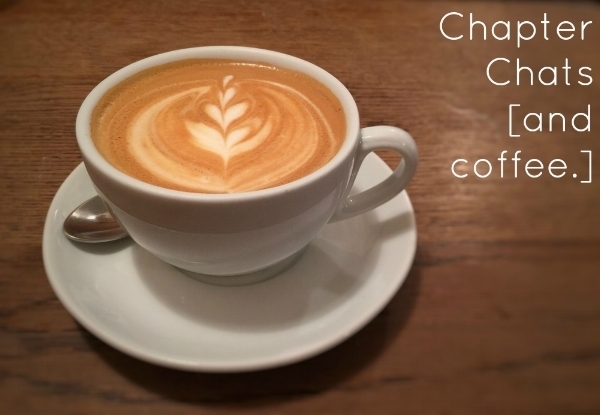 This week's Chapter Chat is Caring for Creation: Inspiring Words from Pope Francis. The book is published by Franciscan media. Ever since the Pope's inaugural Mass, he has lived out a mission to care for the earth that God has given us. From releasing Laudato Si to actively living a pro-life mission, Pope Francis truly aspires to his namesake. The book is composed of the Pope's personal writings, encyclicals, prayers, homilies and tweets that show his passion for God's creation. The introduction sets the tone for the book, saying, "Still, Pope Francis's message is ultimately one of hope...Pope Francis's words reveal that he believe we can move towards a new kind of conversion - a higher level of consciousness, action and advocacy that will spark a 'bold cultural revolution'". The book is divided into five chapters: God's Loving Plan for Creation, Everything is Connected, The Roots of Consequences of the Current Crisis, Called to Protect God's Handiwork, and Towards a Healthier Planet. I'm definetly a Pope Saint John Paul II girl, as proven by my love for NFP, Theology of the Body and Babies. However, when Pope Francis mentions the environment though, he is not diverging from the path that JPII showed the world. Instead of viewing the environment as something that does not include human beings, Pope Francis examines the environment with a holistic approach that includes the humans that live on this earth. He means to connect nature with society for a more appreciative view of the gifts God has given us. The book would make a great read for the New Year to accompany your New Year's Resolutions. We're all called to a greater appreciation of the gifts that God gives us and Pope Francis's words make a great companion on that journey. Pick up a copy today and let me know what you think...and, can you pass the coffee?